2015 marks 500 years since Cardinal Wolsey – Henry VIII’s trusted adviser - commissioned builders to lay the foundations of Hampton Court Palace. The palace will celebrate this historic occasion over the Easter weekend with a spectacular anniversary party. Adrian sends a better example from Chester; perhaps somebody has one in the other format? Another slogan is being used today (1 April) to publicise the Comedy Greats stamp issue - when will they learn that people need to know in advance? It is likely that other Machin versions will exist - MA13, MA12 etc. Indeed MA13 stock was in the Royal Mail machine at Crewe Delivery Office. But the surprise - and perhaps disappointment for collectors and dealers - was that the location identifier, introduced only with the new machines on 2 February, had been removed. Thanks to Stuart and Alf for telling me about Crewe and Bradford North respectively. Mike reports that Mount Pleasant, Camden, Baker Street, Great Portland Street & Trafalgar Square offices in London all have Machin stamps only. 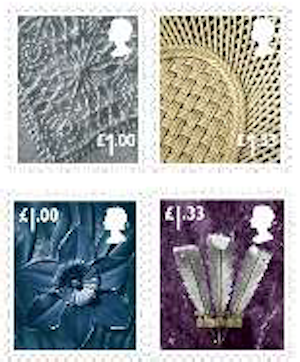 Thanks also to Stuart for pictures of Crewe (M002) and Bradford North (M003) stamps produced yesterday with no name. These are both MA13. Machin Security Stamps coming thick and fast in 2015! 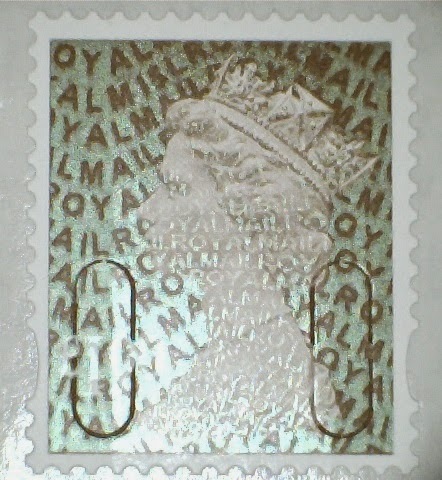 Three new 2105 Machin printings have been reported this week, and we can show two of them here. 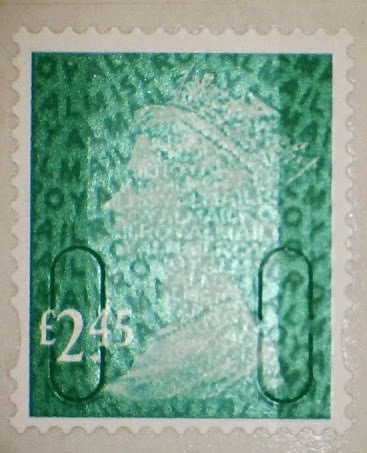 The other new stamp which has been reported to us is the 2p green counter sheet. Pictures will be here as soon as we get them. 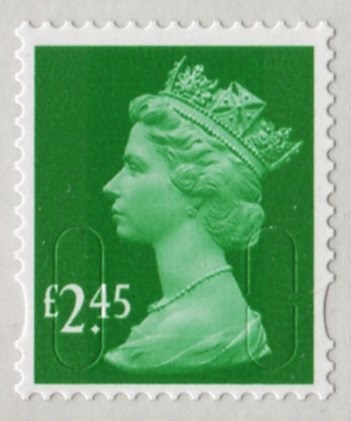 Apologies, this was a misunderstanding; what was mentioned was a new late 2014 / M14L printing of the 2p. 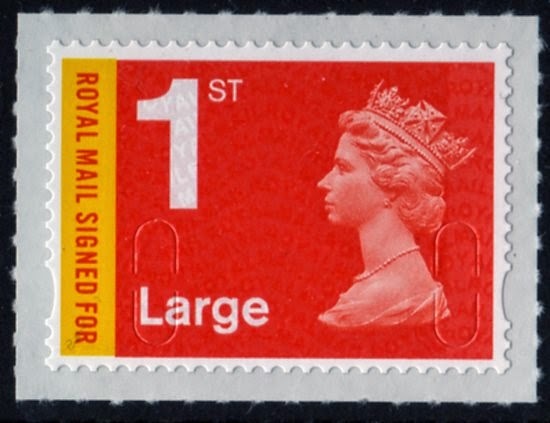 As part of celebrations to mark the 175th anniversary of the issue of the world's first postage stamp, the Penny Black, the BPMA will produce another new Post and Go stamp. 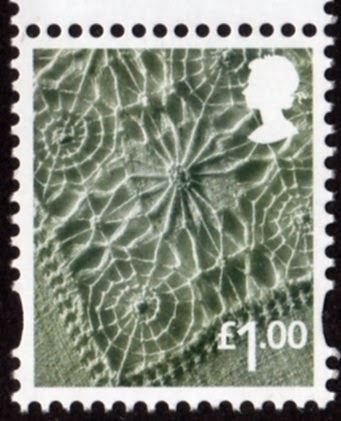 According to GBStamp.co.uk the stamps will include a graphic of the the Maltese Cross, the iconic postmark cancellation. 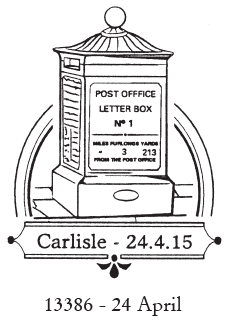 Stamps with the new inscription will be available on the 1st and 2nd class Machin Post & Go stamp designs. The inscription will read "The B.P.M.A. / Penny Black 175". The first day of issue will be 6 May 2015, and they will remain available until 7th August. 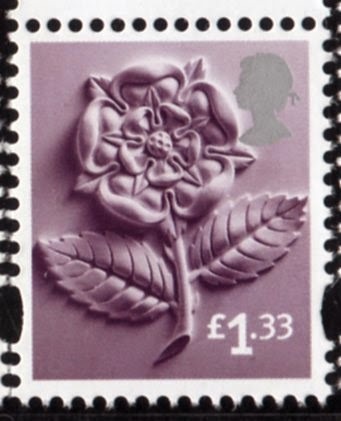 BPMA has released this picture of the Penny Black imprinted Machin Post and Go stamp, with a reminder that the machine will be unavailable from 3.30pm 5 May till 9.30am 6 May. 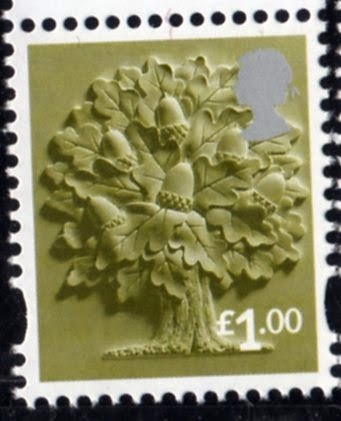 We will not be providing these stamps from the day of issue. As expected all of the Wincor-Nixdorf Post and Go machines have been removed from Post Office branches. Postagelabelsuk has reported that the plug was pulled at the WH Smith Swiss Cottage PO just after 4pm on Monday 23rd March 2015. The following day the last operational kiosk – from Swiss Cottage - was removed to the BPMA store for preservation for decades to come. Technically this is the end of Post and Go in branches as the new NCR machines are designed to cover so many more transactions that simply selling stamps and are designated Post Office Self Service Kiosks. 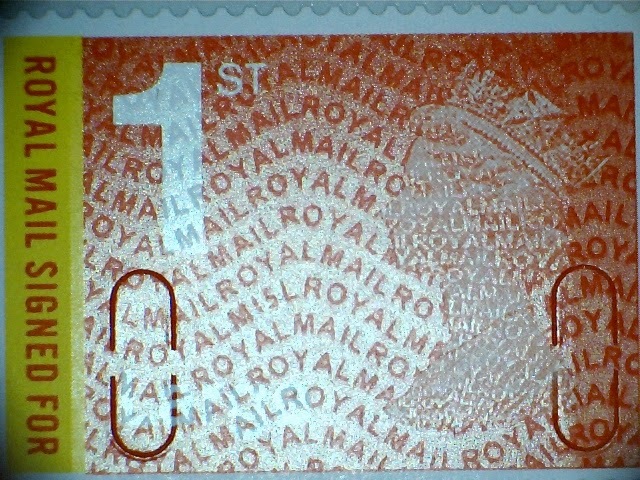 Nonetheless Royal Mail's RM2 machines are still designated Post and Go and that is how we expect them to refer to new stamp issues for the forseeable future. An update from Roy S - Phoned Carmarthen, Perth and Keighley yesterday and they are not having replacement NCR kiosks fitted. So presume that all the WHS offices that had a Wincor kiosk will not have NCR kiosks fitted. Chester-Le-Street, now that it is not relocating, is going to get NCR kiosks. Nicely cancelled by Swiss Cottage PO staff (thanks also to them!) this has one of the now obsolete 2nd class labels, as well as a 1st class stamp with the datastrings showing machine number 1. The last machine number 1 in operation, all the replacement NCR machines being numbered 67 upwards. If you're thinking that you really ought to have had an example of the Label in your collection, we have a few left on our shop, still at the bargain price of £1. These are from Kidderminster. General manager of their Crown branch network, Roger Gale, said: “If the move goes ahead the branch would continue to be run by Post Office Ltd with the current post office team, but from within the WH Smith store. 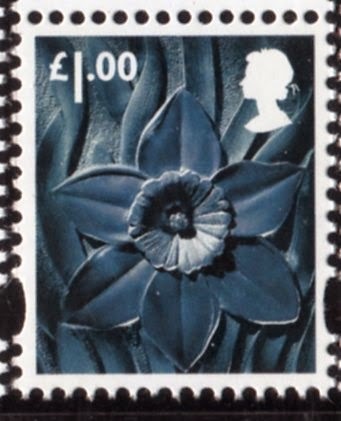 New Machin & country definitive stamps 24 March. 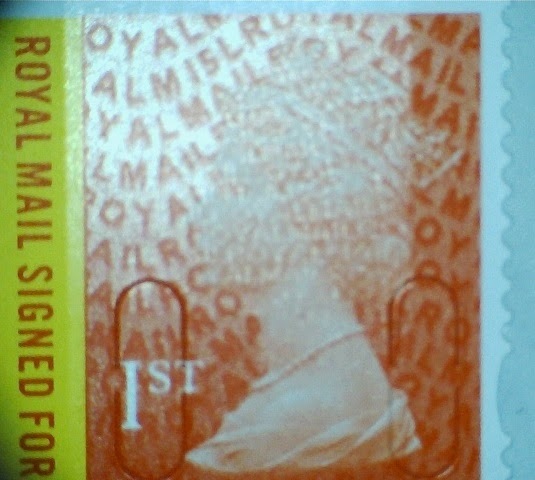 Pictures of the actual stamps are now included in the original post here. 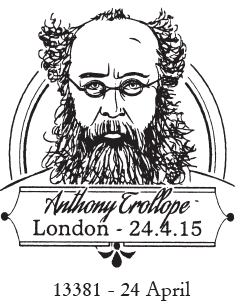 Commemorative Stamp Sheet marks Anthony Trollope Birth Bicentenary. 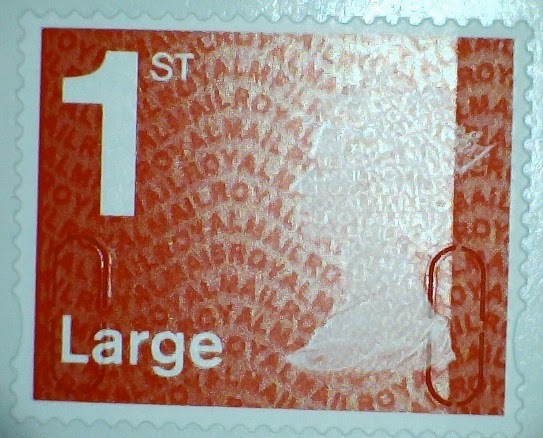 As forecast in the Daily Mail and reported here last year, Royal Mail are commemorating the bicentenary of the birth of novelist Anthony Trollope. 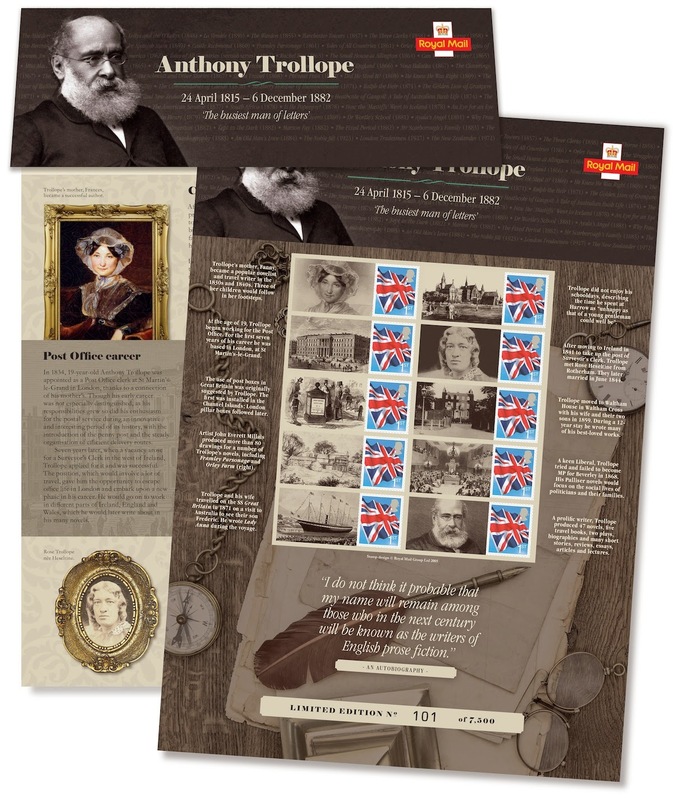 But rather than a set of stamps as forecast, this is a premium-priced Commemorative Sheet. 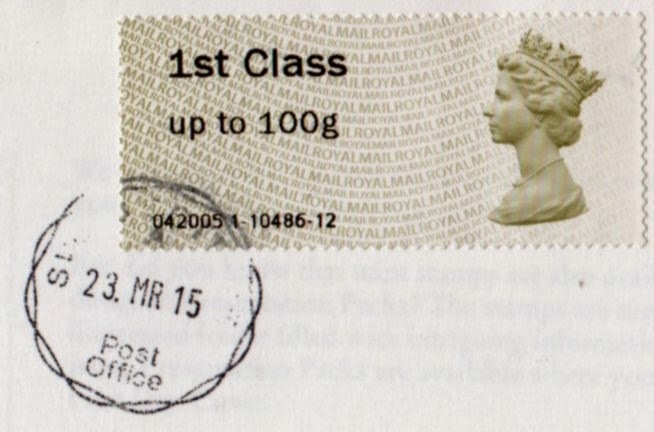 Issued on the bicentenary of the birth of Anthony Trollope (1815-1882) he was one of the most successful and respected English novelists of the Victorian era and had a long association with the Post Office. Anthony Trollope began his career with the Post Office in 1834 when, at the age of 19, he became a Post Office clerk at St Martin’s-le-Grand in London. 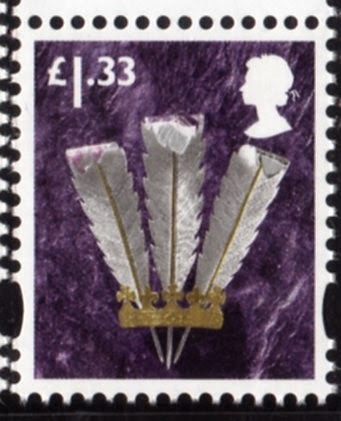 Though his early career was not especially distinguished, as his responsibilities grew so did his enthusiasm for the postal service during an innovative and interesting period of its history, with the introduction of the penny post and the steady organisation of efficient delivery routes. One of Trollope’s key achievements was his determined lobbying for the introduction of pillar boxes into Britain. Such facilities already existed in France and so during a review of postal services in the Channel Islands, he recommended that pillar boxes be trialled in St Helier, Jersey, in 1852. The following year they were introduced to mainland Britain, in Carlisle, and in 1855 London’s first pillar box appeared. 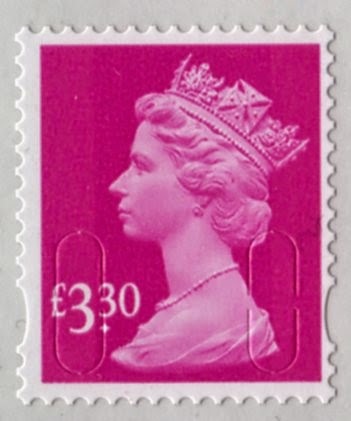 Ref 13381 is available from London Special Handstamp Centre, Mount Pleasant. 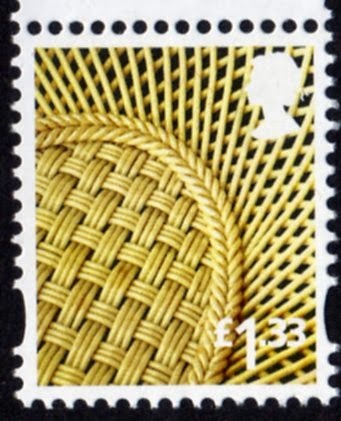 Ref 13386 is available from the North of England Special Handstamp Centre, South Shields. 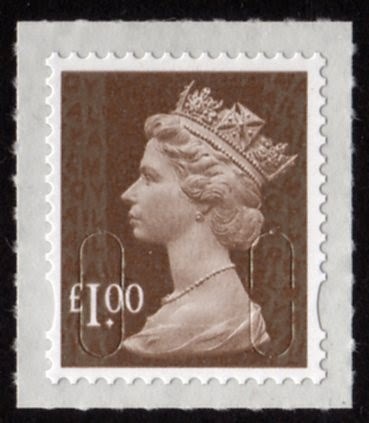 2015 Machin Definitive Stamp reprints now available. 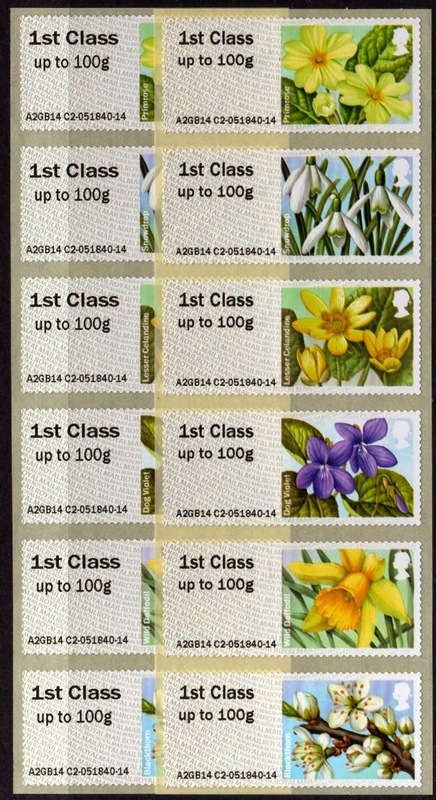 We can now show the 5 new stamps which were originally reported here. The 1p, printed 21/01/15 - for sale in our webshop here. The £1, printed 13/01/15 - in our webshop here. These are expected in stock very soon. If you would like date blocks of the above (we mainly have one of each) please let me know as soon as possible. Otherwise if you wish to order the new values in addition to those shown here to be sent in one batch, please wait until the new values are added. 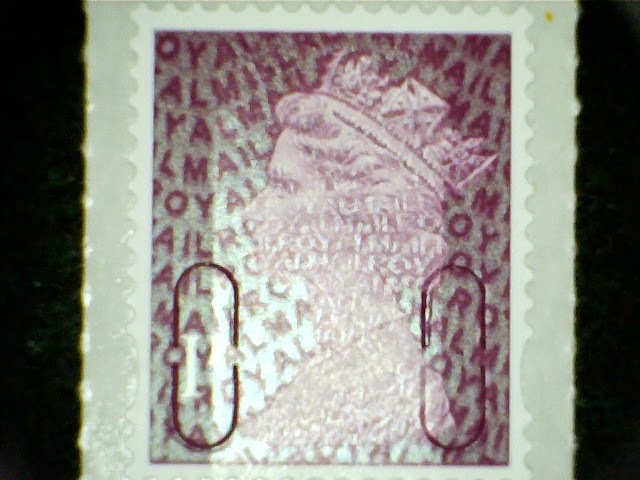 We have sufficient stock of the single stamps. March 2015. 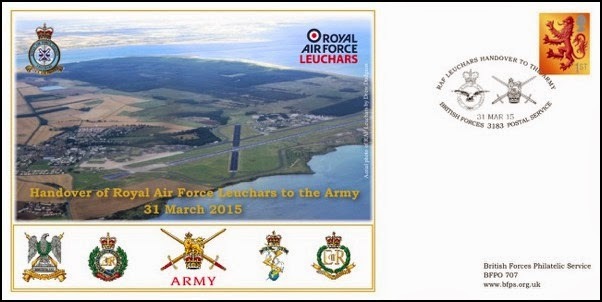 The base will be re-named “Leuchars Station” and will become home to a variety of military units. In recognition of this historic occasion the Forces Philatelic Bureau will be publishing a special commemorative cover. The cover carries a stunning aerial photograph of Leuchars taken by Drew Dudgeon superimposed with the Station crest and the cap badges of the four main military units that will occupy the site. This issue will include a limited edition of the cover signed by the RAF Station Commander, Wg Cdr Neville Clayton, and the incoming Commanding Officer of the Royal Scots Dragoon Guards, Lt Col Ben Cattermole MBE. 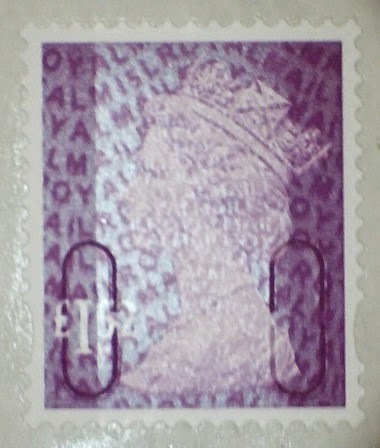 All versions will bear the unique BFPS 3183 special handstamp. The covers may be purchased from the BFPS online shop (www.bfps.org.uk/shop). They will cost just £6 for the unsigned version and £12 for the signed version (UK/BFPO postage and packing free). They are available to order now on a strictly first-come-first-served basis. The covers are also available by post by sending a cheque (payable to ‘BFPS CIC’) to BFPS The Old Post Office, Links Place, Elie, Fife, KY9 1AX Scotland. Post Office Ltd have just launched Free Wifi for customers in 18 crown and agency branches. This means anyone will be able to use Free WiFi in branch with a smartphone, tablet or laptop. "This is part of #thinkdigital and the trial will determine the ways that WiFi can add value to the Post Office business, customer experience and brand. "Just go to one of the 18 branches in the trial with your smartphone or tablet, connect to the hotspot ‘_Post Office Free WiFi’, then register with your name and email address to get online." The trial branches are: Aldwych, Barking, Canary Wharf, Canning Town, City of London, High Holborn, Hitchin, Houndsditch, Kennington Park, Kings Cross, Kingston Upon Thames, Kingsland High Street, Old Street, Poplar, Shepherds Bush and Stratford in London, and Birmingham and Nottingham. Once again Post and Go machines will be at the Scottish Congress in Perth. The organisers have again made arrangements to supply collectors with Post and Go and other souvenirs. I'll not be stocking these and you are advised to make your own arrangements to obtain them. 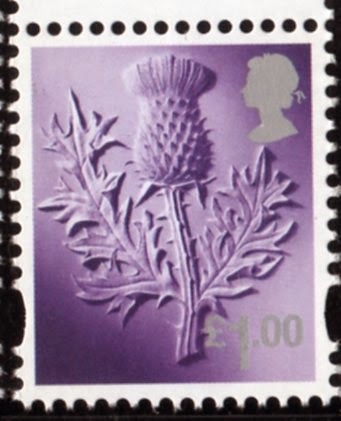 The Annual Congress of the Association of Scottish Philatelic Societies will be held at Perth on 17-18 April 2015. Once again there will be new items of interest to collectors. 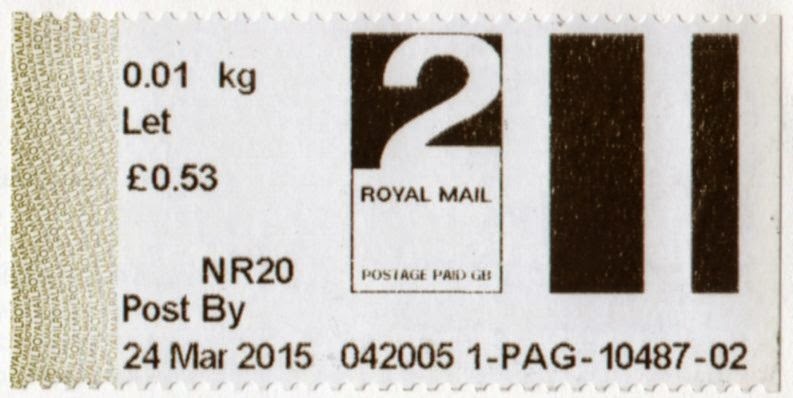 Royal Mail Post and Go kiosk numbers A003 and A006 will be used at Congress for both Machin and Union Flag stamps. Congress overprints will be available from both machines for the Collector’s Strip (£7.68), or strips of six of each of 1st Class (£3.78), Large (£5.70), Europe 20g (£6.00), and 60g (£9.12), World Wide 20g (£7.98) and 100g (£13.50). Also available are two Post and Go Smiler sheets (Union Flag and Saltire Flag) whose designs are being finalised. The sheets will each cost £18.65 (A4). All items are charged at cost plus postage and packing as detailed below. Purchasers will be advised if the weight of their order exceeds the above costs and additional payment is required. Special posting requests for all the above items will be costed and purchasers advised prior to sending the items. 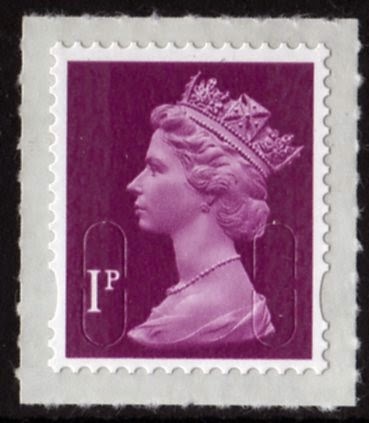 The Association is happy (as a service to collectors) to provide these items to collectors at face value with a modest additional charge to cover postage and packing. Where the order (or multiple orders) exceeds £100, we regard these as ‘trade’ orders and will make an additional 10% handling charge to reflect the time and effort involved in fulfilling the order. Will be attending the 86th Scottish Congress with Post and Go Kiosk number JE01. 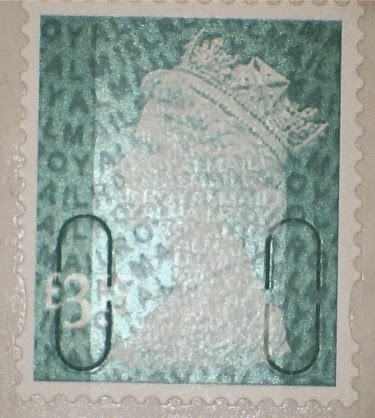 This will print stamps with either the Jersey flag or the Protected Species stamps. 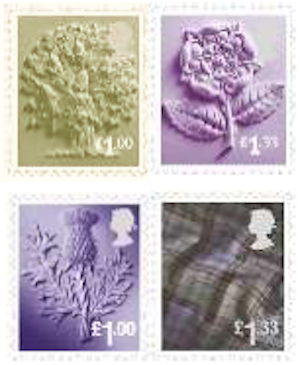 The flag stamps will carry the inscription 86th Scottish Congress 2015. 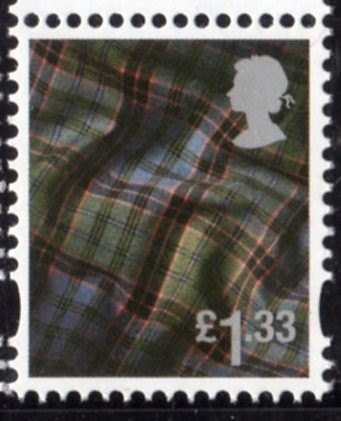 Paypal account: dundeephilatelic@btinternet.com. Paypal surcharge on all orders: 4% of total order. 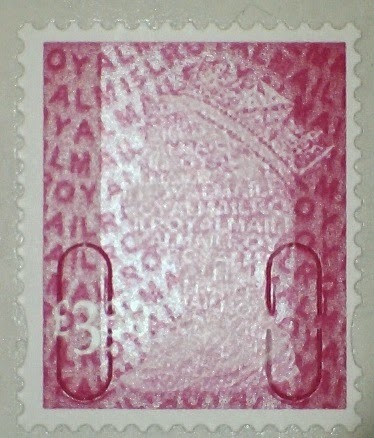 Cheques/Postal Orders in sterling should be made payable to ‘ASPS’. The Falkirk and District Philatelic Society is celebrating its 50th birthday and hosting Congress. The Society has designed a commemorative cover which depicts Callendar House, located in Falkirk. 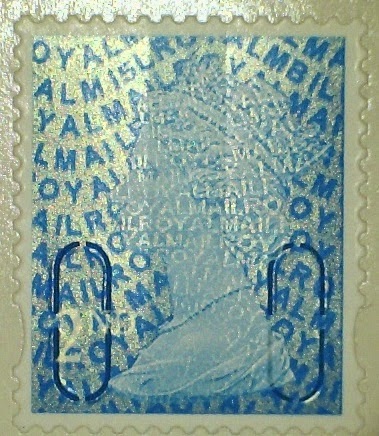 The House is also featured on the special postmark being used at Congress. Unserviced covers are available for 50p each. Serviced covers will be available for £1.50 each. Postage and packing will be £1 (UK) or £2.50 (overseas) in addition per order. 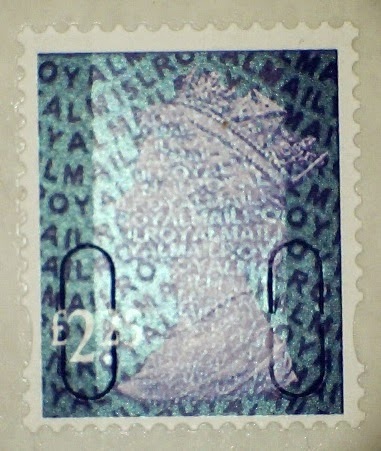 Please note that if you require a Post and Go stamp on a serviced cover you must specify this when ordering from the Society. Updated: Now, here's a thing. When the Congress organisers first sent me information to publish - which I am quite happy to do - they had had 'official' information about the machines to be taken to Perth. But machine A004 was included, rather than A006, and the UK prices quoted were then current prices, which would increase as usual by April 17th. 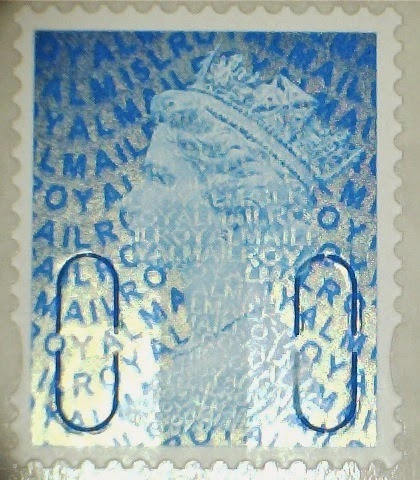 There was also a discrepancy with the content of the Guernsey machine which, as we know had different service indicators at Stampex to those originally publicised by Guernsey Post. The organisers have not received a requested update from official sources, so the Press Release above is based on logic and a bit of 'digging'. But further exploration of the IAR site has quite different information, which cannot be verified from official sources. According to the Events page on that site, machines A003 and A006 will be in Perth, and so will JE01 dispensing Jersey Flag and Threatened Species. And on the 'Kiosks' page, no future events are shown for GG01 of Guernsey Post. Update: Via Twitter, Jersey have confirmed the revised information in the body of the post. Guernsey have now replied that they will not have a machine in Perth. Although not yet announced by Royal Mail, pre-order facilities are now available. I originally said that this would be for the B001 machine, although as the form indicated A003 and A006 I changed it. Now, I'm told that it pre-orders are for B001 only. As you have to collect them at Perth, it seems sensible to ignore the uncertainty and buy them from the A machines. 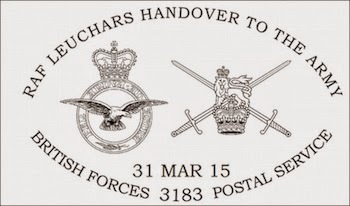 But if you do want to get them from B001 you can do so via the IAR website here. 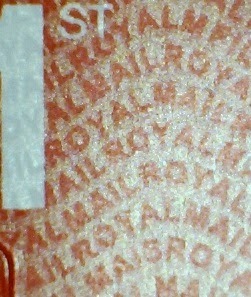 This covers Royal Mail stamps and Smilers Sheets but not the Jersey stamps. 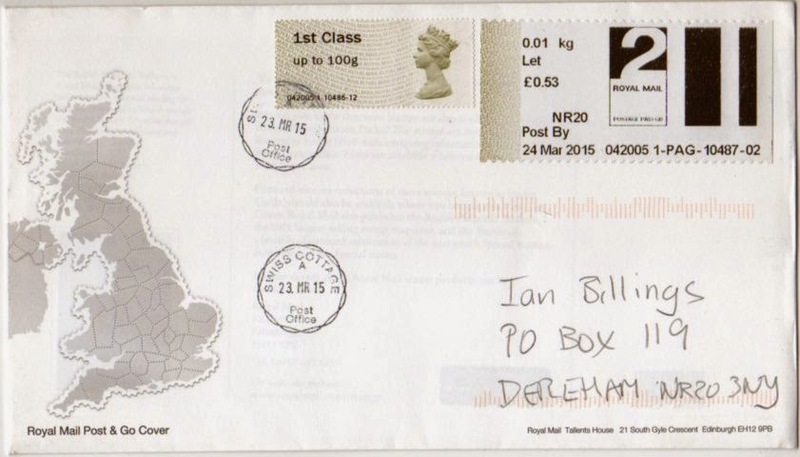 A round-up of news from various sources including regular contributors and the Royal Mail Philatelic Bureau. Thanks to all who have sent information or links. Another Museum from the Navy Group. Royal Mail have announced that a new Post and Go machine will go live at the Fleet Air Arm Museum at Yeovilton in Somerset 'later this month', ie March 2015. 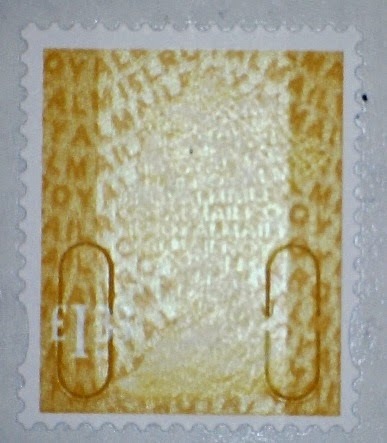 The inscription will be 'The FAAM'. This is expected to be machine A004, retired from mobile/exhibition use. 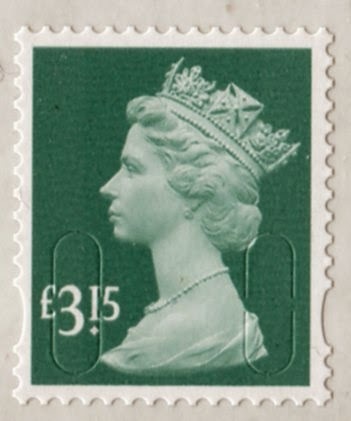 According to the IAR website, collectors and dealers visiting the (Salisbury) stamp fair at Andover on 14/15 March should not expect to find the machine running at Yeovilton that weekend. More information and pictures in due course. We will not be stocking these. According to the Philatelic Bulletin a Post and Go machine will be at Taipei but will not be dispensing stamps. It will be part of the International Security Printers stand, and will dispense non-postal commemorative labels. Machines A002 and A005, located at Portsmouth's National Museum of the Royal Navy and Southsea's Royal Marines Museum respectively will carry the additional inscription 'VE Day 70' from 8 May to 29 May 2015. Given the installation of A004 at Yeovilton in March it would be surprising if the Fleet Air Arm Museum did not also mark this anniversary. We will not be stocking these. 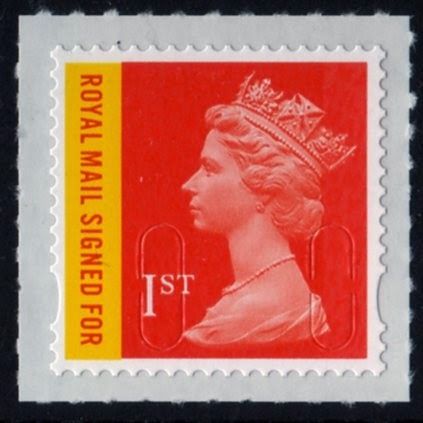 Royal Mail will be attending the Essen show for the first time on 7-9 May 2015. 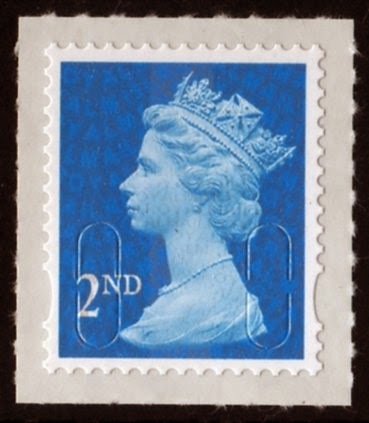 Union Flag and Machin designs will be available on machine A006 with a ‘Messe Essen 7-9 May 2015’ overprint. Guernsey Post will also attend with machine GG01, vending the Guernsey Flag and Union Flag designs. Unlike the shows at Melbourne and Philakorea no GB versions will be made available from Tallents House. We will not be stocking these, but we have a contact who will take orders for Taipei and Essen. Please ask if you are interested.